I’ve been in a Christmas-y mood lately and just had to share these free Christmas printables with you. :) I always reserve the weekend right after Thanksgiving for holiday decorating, but this year I couldn’t resist putting a few decorations up early! November is a totally acceptable time to blast Christmas tunes and get tangled up in lights and garland, right? Ha! Ready to spruce up your holiday décor? Deck your halls with these free Christmas printables. You can download the PDF and JPEG versions here. I recommend printing on thick, matte cardstock. Tag me in your photo on instagram (@lexzurcher), I’d love to feature your photos on the blog! Also…tis the season for holiday shopping! Check out the awesome holiday gift card giveaway below. 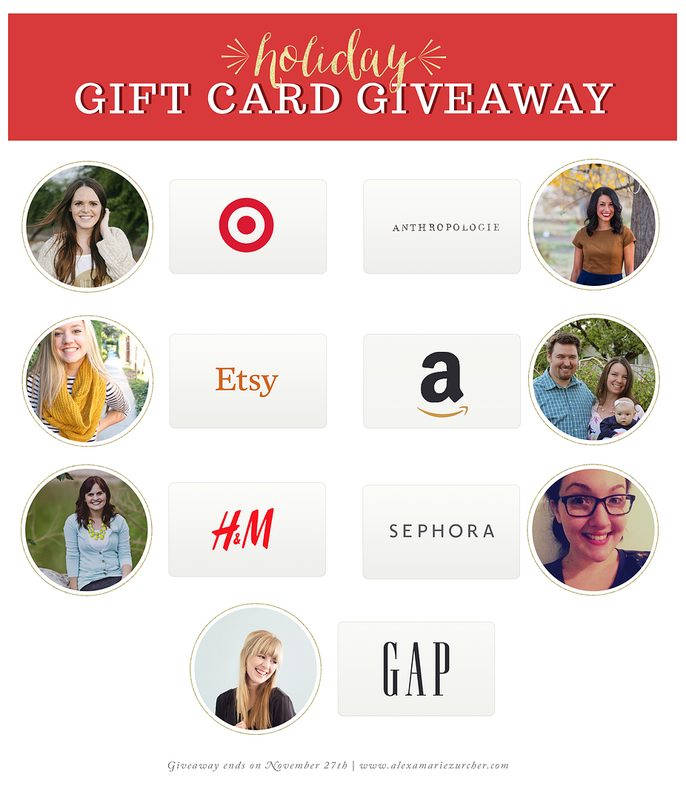 These lovely ladies and I have teamed up to bring you SEVEN $25 gift cards from our favorite stores, just in time for some holiday shopping! Get everyone on your list their favorites from Target, Anthropologie, Etsy, Amazon, H&M, Sephora, and Gap. You can enter below. Giveaway ends on November 27th. All entries will be verified. Good luck! Totally printing these out this week, you are so talented! I love the ornament printables. They're so cute. Such a fun giveaway- I love those stores! The printables are so cute!! and the giveaway is great too! Those printables are adorable! And yay for the giveaway! i might keep a few of these gift cards for myself, but i'd also use them to buy christmas presents for people. It would be awesome to win this...oh and I'm totally printing those free printable. thank you! Great printables! Thanks for running the giveaway! I love your blog. Great Printables! Oh wow, I would LOVE to win this! Thanks for the opportunity! Your prints are so cute! eeeeek! cannot wait to see results. LOVE all those stores! what a fabulous giveaway. You always have the cutest printables! Oooh, love these printables! The O Holy Night is my favorite! Love those printables. I will definitely be adding those to my Christmas decor. Thank you. What a great giveaway! Thanks for the chance! Happy Holidays! Your printables are always so cute! Always always always! How fun! I think they are just perfect to use this holiday season! Thanks for the opportunity! So cute! And I think we could totally be friends. I LOVE GAP! My goodness -- what an amazing giveaway!! Yay!!! I am SO excited for Christmastime!! great giveaway! I love your printables! So fun! Love the giveaway, even if I don't ever win any! your prints are so cute!!! This would be an awesome giveaway to win! So much fun! Love your blog! The printables are so pretty! Thanks for the giveaway, it's perfect for Christmas! Thank you for the cute printables and the giveaway! I love that these printables are all about the real reason we celebrate! Thank you for the chance to win a gift card! Cute prints!! Hope i win! Oh so creative! I love those prints!!! Thanks for the fun giveaway! oooh so amazing, thanks so much! Love all the printables, I think Oh Holy Night is my fav though!